The annual three-day SDS/2 Users Group Conference is primarily a learning opportunity. Activities include training on specific topics determined by the Users Group, the unveiling of new enhancements, award presentations and other activities. This year's conference will be held October 12th through the 14th at the Embassy Suites in Lincoln, Nebraska. The 2016 SDS/2 Solid Steel Competition is now open. All entries, including the job and fabricator, must be received at Design Data by August 14, 2016. Entries will be evaluated equally on: aesthetics of the project; complexity (modeling difficulty, connection design); and tonnage (weight). The awards will be presented at the 2016 SDS/2 Users Group Conference in Lincoln, Nebraska. 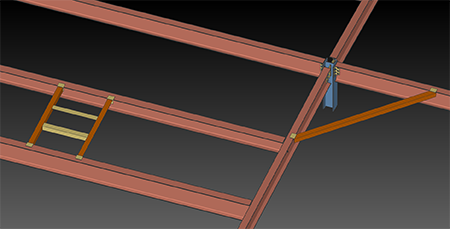 Design Data will host two New/2 2016 support webinars in July: Roof Frame Member and Part Library on July 13; and Drawing Editor Upgrades, Transmittal Tool and Output Configuration Per Job on July 27. Both webinars will take place at 10:30 a.m. CST. The seminar takes place on July 26th at the Courtyard by Marriott Liberty Station. The hotel is located at 2592 Lanning Road, and there will be complimentary on-site parking during the event. The cost for the seminar is $30 per attendee, and includes breakfast. The seminar takes place on July 27th at the Courtyard LAX / Century Boulevard, located at 6161 W. Century Boulevard. Valet parking only, at a cost of $12 during the event, and $34 for overnight guests. The cost for the seminar is $30 per attendee, and includes breakfast.